For rudders, airbrakes, and nose wheel steering, you need three servos - one on each rudder and one for the nose wheel. Each servo must be plugged into a separate receptacle on the receiver. MIX 1. Rudder Servo #1 (master) -> Rudder Servo #2 (slave) This simply makes the rudder servos work together as rudders. They should move in the same direction, using the rudder stick on the transmitter. MIX 2. Rudder Servo #1 (master) -> Nose Wheel Steering Servo (slave) This is to control the nose wheel servo with the rudder stick on the transmitter, as usual. MIX 3. Airbrake Channel (master) -> Rudder Servo #1 (slave) You can choose which channel you wish to use for airbrakes. The easiest is probably the retract switch, but you may prefer a flap knob or some other switch on the transmitter that is not being used. MIX 4. Airbrake Channel (master) -> Rudder Servo #2 (slave) Same as above. The rudders should both deflect outward when the airbrake channel (retract switch) is activated. You should still have some rudder control when the airbrakes are deflected. Hi Bruce, Thanks again for a great kit. The split rudder airbrakes gave me some serious trouble using a Futaba 7CAP transmitter. This is due to it only providing 3 Mixers and not the 4 Mixers you give in your website example. This is a popular transmitter and I thought this solution might be of use to you and your customers. It also provides the added benefit of being able to mix elevator in with the airbrakes without any additional hardware mixers. So when I throw SW G and activate the Airbrakes (Rudder2 on Chan6) the same switch G also activates PMIX3 Rudder1 with an offset. The result is both rudders move on the same switch G. The bonus is that due to using the Airbrake function I can also go to A.BRAKE settings and dial in an elevator correction should one be needed during airbrake deployment. 1. that the trim lever on Rudder1 only moves Rudder1 on Channel 4, not Rudder 2. 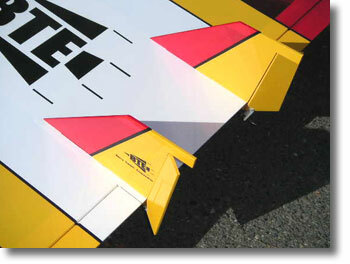 2. the amount of Airbrake on the Rudders has to be adjusted in two places (A.BRAKE and PMIX3). Futaba-RC.com offers detailed instructions in their FAQ section, just click the link below. If you are a 9C user (like me), you will find a wealth of info there that will help you get the most out of your transmitter. LINK How do I set up the 9C for a delta wing with dual rudders? Can I use the dual rudders as airbrakes? #1 MIX = Makes the nosewheel move with the right rudder. #2 MIX = Makes the left rudder work with the right rudder. #3 MIX = Using this switch activates the right rudder to be an airbrake. #4 MIX = Using this switch activates the left rudder to be an airbrake. Hope this makes sense to you. It works for me.........Tony"
"The kit was great. I have been building kits since the early 80's and found that your instructions were great and your building tips told me things I had not known or done before. "I had a big problem finding someone to help me program my JR 8103. After several calls to the people who did the magazine articles and several calls to JR, I finally got a call back from JR.
"Thanks again for a great model." Bruce's Comment: Buyer beware! I have modified Lloyd's original instructions slightly, because he needed to use the GEAR switch for the retractable gear on his DV. Instead, he used the FLAP MIX switch on the transmitter, which is a three-position switch and introduces a serious problem. Flipping the FLAP MIX switch the wrong direction would deploy only one rudder, a mistake you would not want to make on short final. So I strongly suggest you use the GEAR switch, although the programming shown above is not proven and may require tweaking.